We are licensed for only 32 children 18 months through 13 years old with full-time and part-time options available allowing for more individualized care for your child. View our programs below by age group. At Mary-Go-Round Learning Center, the Explorer classroom is designed for your child to be able to “discover me”. The daily schedule is balanced among active play, independent explorations, and small group interactions. Our teachers combine stories, music, games, arts and crafts, and group activities to encourage learning and fun. At Mary-Go-Round Learning Center, our teachers interact with each child to develop a secure and trusting relationship. Your child will learn to be kind, respectful, and gentle with friends. Our teachers model politeness, using words like “please” and “thank you” at all times. At Mary-Go-Round Learning Center, the Explorer classroom is arranged to include learning centers such as block-building, dramatic play, sensory tables, music and dance, and books. Each center contains age appropriate toys and equipment to encourage exploration and cooperative play with friends. At Mary-Go-Round Learning Center, small group sizes allow for personalized care to provide challenges and opportunities for growth at each individual child’s pace. At Mary-Go-Round Learning Center, the Discovery classroom is designed for your child to build confidence and social skills. Our program will help your child understand the meaning of friendship, cooperation, sharing, problem-solving, and manners. At Mary-Go-Round Learning Center, the Discovery classroom offers a center-based environment to encourage independent and cooperative play. Learning centers such as dramatic play, blocks, science, math, creative art, and reading are strategically organized to help build social skills, self-esteem, and vocabulary. The goal is to challenge growth through play. At Mary-Go-Round Learning Center, activities are presented to offer a vast amount of exposure to literacy, math, and science. Each day includes morning meetings, stories, music, calendar, and weather. Our program will focus on literacy, phonological awareness, print awareness, and oral language. This program will introduce letter and number formation as well as recognition. The goal is to provide an academic foundation that prepares your child for future success in learning. At Mary-Go-Round Learning Center, the Creative Classroom will open a new world of learning. A strong academic foundation is built using math, science, literacy, and writing activities. This is the year that your child will begin to expand on skills critical for future academic success. At Mary-Go-Round Learning Center, the core curriculum program is “Let’s Begin with the Letter People”. This comprehensive curriculum program is organized around themes such as, “All About Me” and “Insects Everywhere” that integrate knowledge across different subject areas of literacy, math, science, and phonetic awareness. At Mary-Go-Round Learning Center, “Handwriting without Tears”* is used as a primary component in supporting your child’s handwriting skills. The program focuses on your child’s motor development and on the ability to understand the construction of each letter. Carefully selected materials make learning to write fun for your child. 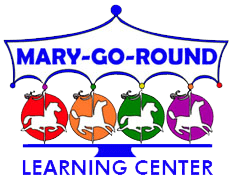 At Mary-Go-Round Learning Center, your child will explore, learn, and grow within our enriching classroom based on the Common Core* curriculum frameworks. Opportunities are provided for one-on-one instruction and small group learning. Each day consists of morning meeting, math, science, literacy, free choice, and outside play. The goal is for each child to become independent, self-assured, and graduate with a strong academic foundation for entering kindergarten. 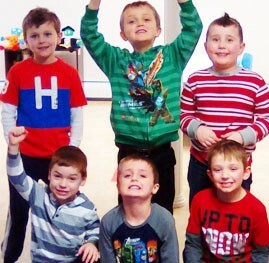 * Aligned with Hooksett school system to facilitate an easy transition to kindergarten and elementary school. At Mary-Go-Round Learning Center, both morning and afternoon transportation for the Underhill Kindergarten program is provided. At Mary-Go-Round Learning Center, your kindergarten child will explore, learn, and grow within our enriching classroom that is based on the Common Core standards. The Common Core standards set goals for student mastery in English language arts and mathematics. The study of English language arts includes reading, writing, speaking, and listening. The mathematics standards emphasize a proficiency in math. Teachers will provide opportunities for one-on-one instruction and small group learning. Opportunities are also available for group activities, free-choice activities, and outside play. The goal is for your child to become independent and self-assured. At Mary-Go-Round Learning Center, “Handwriting without Tears” is used as a primary component to support your child’s handwriting skills. The program focuses on motor development, and the ability to understand the construction of each letter, which is consistent with the teachings in kindergarten. At Mary-Go-Round Learning Center, we provide an enrichment program to reinforce the kindergarten curriculum, readying your child for success in first grade. At Mary-Go-Round Learning Center, we offer programs for school aged children from 6 to 13 years old. We offer before and after-school care, as well as the option of childcare during school vacations, teacher workshop days, early-release, weather closures, and a summer camp program. The Hooksett bus route stops right in front of our facility, creating a simple, safe, worry-free environment to transport your children to and from school. At Mary-Go-Round Learning Center, before school children have a creative place to spend their morning, while after school children are offered a healthy snack and supervised activities. The completion of homework is encouraged and assistance is available, if needed. At Mary-Go-Round Learning Center. we offer the option of summer childcare with our structured, active and creative summer Camp. A focus is placed on cooperation, teamwork, sportsmanship, honesty and responsibility. At Mary-Go-Round Learning Center, we coordinate with the Hooksett Public Library encouraging the Summer Reading Program. The theme for summer 2017 is “Taking Care of our Community”. At Mary-Go-Round Learning Center, we will plan field trips to the Hooksett Public Library, state lakes, state parks, playgrounds, and hiking trails.